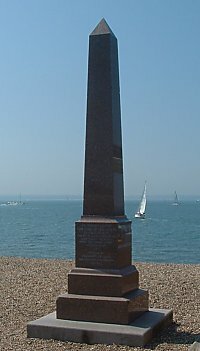 On Clarence Esplanade, Southsea close to and west of the Royal Naval Memorial. 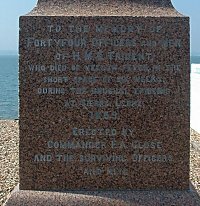 This memorial is a red granite tapering column set upon a four stepped base, with inset lead lettering. Surgeon's general remarks. William Mackay Ogilvie was appointed Assistant Surgeon of HMS Boscawen on 12 August 1858 and left Plymouth for Africa on 24 August, arriving on 9 September 1858. 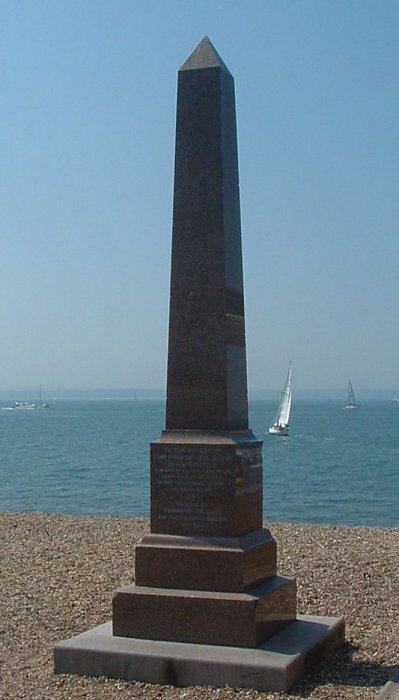 He reported to Commander Francis Arden Close of HMS Trident and remained in her until she was paid off at Woolwich on 12 November 1859. On 1 November 1858, the Trident's Surgeon John C Ingles was invalided and Ogilvie took over as medical officer. During the period of this journal the total number of patients was 513, of which 414 returned to duty, 75 were sent to hospital, 21 died (17 on board and 3 in camp) and 3 were invalided. The most prevalent diseases were yellow fever, cephalalgia, catarrhus, phlogosis, abscesses, debilitas, colica, remittent fever, rheumatismus, vertigo and diarrhoea. The surgeon sets out the measures taken to prevent the yellow fever spreading, including avoiding inhaling the breath of patients and keeping to windward of them, and an extra allowance of spirits to the stokers while the ship was under steam, on account of their suffering exhaustion from the excessive heat of the stoke hold. 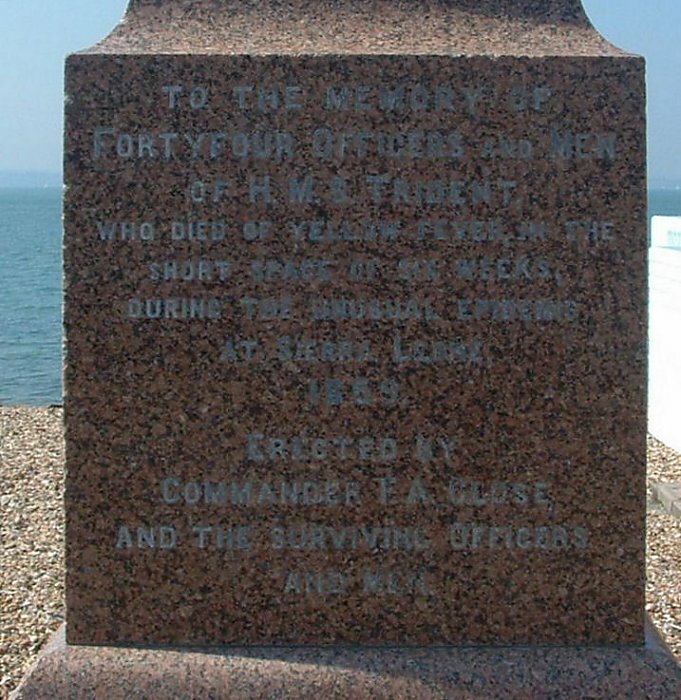 The total number of deaths was 44, including one officer and 16 men of HMS Heron, 17 died on board, 21 at the Garrison Hospital, 3 at the Mountain Convalescent Hospital, and 3 at Comfortless Cove. It was the most malignant yellow fever outbreak on the West Coast of Africa since that on HMS Éclair in 1845, which carried off 59 of 108 men. There is a copy of 'Sanitary and Hygienic Measures' recommended by Assistant Surgeon Ogilvie, in 27 points, to Commander Close and the lieutenant in charge of the Kroomen on board HMS Trident off Comfortless Cove. Commander Close responded by saying they were 'a great piece of impertinence' and that the Assistant Surgeon was ordering him as the Captain of the ship. Assistant Surgeon Ogilvie acknowledges the assistance of Lieutenant Carter in carrying out his hygienic measures. He also copies Commander Close's speech to the men when George Oakwell would not obey Mr Ogilvie's instructions to avoid spreading the disease. He expresses his opinion of the great value of the disulphate of quinine and especially the quinine wine, which was regularly give to the officers and men. It was also very highly thought of by the men and on shore. He explains how he produced chlorine gas on board and its effectiveness as a disinfectant. Some instructions for officers in charge of boats on detached service are also copied. The weather and temperature is discussed briefly and 'the economy of HMS Trident', the daily routine. Folio 1: Mr John Wood, aged 42, 1st Class Assistant Engineer; disease or hurt, typhus icterodes. Put on sick list, 28 June 18859, at Ascension Island. Discharged to Ascension Hospital the same day. He had been forward amongst the sick during the Trident’s passage from Sierra Leone. Folio 2: George Smith, aged 27, Stoker; disease or hurt, typhus icterodes. Put on sick list, 28 June 1859, at Ascension Island. Discharged to Ascension Hospital the same day. Folio 2: George Slater, aged 23, Stoker; disease or hurt, typhus icterodes. Put on sick list, 28 June 1859, at Ascension Island. Discharged to Ascension Hospital, 1 July 1859. Folio 2: Samuel Higgins, aged 16, Boy 2nd Class; disease or hurt, typhus icterodes. Put on sick list, 28 June 1859, at Ascension Island. Discharged to Ascension Hospital, 30 June 1859. Folio 2: George Popejoy, aged 18, Ordinary Seaman; disease or hurt, typhus icterodes. Put on sick list, 28 June 1859, at Ascension Island. Discharged to Ascension Hospital the same day. Folio 3: Edward Lane, aged 24, Stoker; disease or hurt, typhus icterodes. Put on sick list, 28 June 1859, at Ascension Island. Discharged to Ascension Hospital, 30 June 1859. Folio 3: Tom Peters, aged 31, Krooman; disease or hurt, typhus icterodes. Put on sick list, 29 June 1859, at Ascension Island. Discharged to Ascension Hospital, 1 July 1859. Folio 3: Mr H N Atkinson, aged 18, Master's Assistant; disease or hurt, typhus icterodes. Put on sick list, 28 June 1859, at Ascension Island. Discharged to Ascension Hospital, 29 June 1859. Folio 3: Joseph Priestley, aged 21, Shipwright; disease or hurt, typhus icterodes. Put on sick list, 29 June 1859, at Ascension Island. Discharged to Ascension Hospital the same day. Folio 4: James Mardling, aged 19, Ordinary Seaman; disease or hurt, typhus icterodes. Put on sick list, 22 June 1859, between Sierra Leone and Ascension Island. Died at Trident Camp, Comfort Cove, Ascension, 30 June 1859. Came to the notice of Assistant Surgeon Farreley on 28 June when he first went on board the Trident. He was in such a poor state that it was though inadvisable to send him to the hospital. Folio 4: Frederick Bullen, aged 21, Ordinary Seaman; disease or hurt, typhus icterodes. Put on sick list, 30 June 1859, at Ascension Island. Discharged to Ascension Hospital, 1 July 1859. Folio 4: Charles Seabeck, aged 52, Stoker; disease or hurt, typhus icterodes. Put on sick list, 30 June 1859, at Ascension Island. Discharged to Ascension Hospital, 1 July 1859. Folio 4: Benjamin Deny, aged 29, Able Seaman; disease or hurt, typhus icterodes. Put on sick list, 30 June 1859, at Ascension Island. Discharged to Ascension Hospital, 1 July 1859. Folio 5: Mr John Buist, aged 24, 3rd Class Engineer; disease or hurt, typhus icterodes. Put on sick list, 2 July 1859, at Ascension Island. Discharged to Ascension Hospital, 3 July 1859. The only remaining engineer of the Trident, the others either dead or in hospital. He had been berthed in the part of the ship were mortality was greatest. Folio 5: William Poulton, aged 21, Stoker; disease or hurt, typhus icterodes. Put on sick list, 2 July 1859, at Ascension Island. Discharged to Ascension Hospital, 3 July 1859. Folio 5: Alfred Heazzard, aged 17, Boy 2nd Class; disease or hurt, typhus icterodes. Put on sick list, 3 July 1859, at Ascension Island. Discharged to Ascension Hospital, 7 July 1859. Folio 6: Thomas Bowry, aged 21, Able Seaman; disease or hurt, typhus icterodes. Put on sick list, 3 July 1859, at Ascension Island. Died at Trident encampment, Ascension Island, 5 July 1859. Folio 6: James Stevens, aged 20, Ordinary Seaman; disease or hurt, typhus icterodes. Put on sick list, 3 July 1859, at Ascension Island. Died at Trident encampment, Ascension Island, 6 July 1859. His fever was of a more inflammatory character than the surgeon had hitherto seen. Folio 7: John Jackson, aged 21, Able Seaman; disease or hurt, typhus icterodes. Put on sick list, 4 July 1859, at Ascension Island. Discharged to Ascension Hospital, 7 July 1859. Folio 7: Robert Faulkner, aged 19, Ordinary Seaman ; disease or hurt, typhus icterodes. Put on sick list, 6 July 1859, at Ascension Island. Discharged to Ascension Hospital, 7 July 1859. Folio 7: John Beavington, aged 30, Captain’s Cook ; disease or hurt, typhus icterodes. Put on sick list, 9 July 1859, at Ascension Island. Discharged to Ascension Hospital, 9 July 1859. He had been employed on board the ship and exposed to the 'contagious influence of the disease', he wanted his symptoms to be attributed to rheumatism. Folio 8: Mr Joseph Bignell, aged 32, Paymaster ; disease or hurt, typhus icterodes. Put on sick list, 11 July 1859, at Ascension Island. Discharged to Ascension Hospital, 11 July 1859. Had been employed on board the ship and, although very afraid of the fever, believed himself free of infection as no person aft had up to that point been attacked. Folio 8: Note that Joseph Bignell was the last case of fever among the Europeans but the Kroomen continued to be attacked until 15 July. The disease was almost completely confined to the lower deck and engineer's mess. Folio 8: A nosological synopsis of the sick book kept during the period of this journal, in conformity with the 30th article of the Surgeon’s Instructions. With a note that the cases of cephalalgia, vertigo etc were really fever cases but the symptoms were first prominent without pyrexia. Folios 9-10: Surgeon's general remarks. The Trident arrived at Ascension on 27 June 1859, from Sierra Leone where she had contracted yellow fever and lost 17 men on the passage. Assistant Surgeon Farreley took charge of the sick on 28 June, Surgeon Ogilvie being exhausted and sent to hospital. The road to the hospital in the mountains had been made impassable by torrential rains and many of the sick had to be wait an opportunity to be sent there. On 30 June the ship's company went ashore and established a camp where they remained until the ship left for England. The sick were kept separate from the healthy. On 7 July the hospital could again receive sick and all the Europeans were sent, the Kroomen were treated at the encampment. The disease was mild at first but assumed greater mortality.